It’s goal check in time. How are your new year’s resolutions going? We’re two months in, which has given us all plenty of time to make it or break it. That sounds extreme, though, and, like I’m experiencing, staying the course with ambitious goals is much more of an average, everyday kind of grind. I set out this year with six big goals for the blog. One of them, just one, is to get on a consistent schedule for posting. It entails developing a workflow to document recipes from idea to blog post, incorporating recipe ideas and future posts into weekly meal planning, mapping out every single task involved in a blog post on my calendar, and looking forward to finally get on board with posting recipes that are useful for upcoming holidays. Throughout over two years of blogging, I’ve tried using an editorial calendar on and off, and I just do better with the calendar. If I’m attentive to jotting down recipe ideas when they strike, this doesn’t result in contrived, forced posts. It results in sharing more of the recipes I’m actually creating in my kitchen, whether for special occasions or, more often, real life meals. So here’s my goal check in: it’s all too easy to get caught up in the five goals I haven’t touched, not to mention the wood floors that need mopping or the Connecticut name change I haven’t completed four months after my wedding. 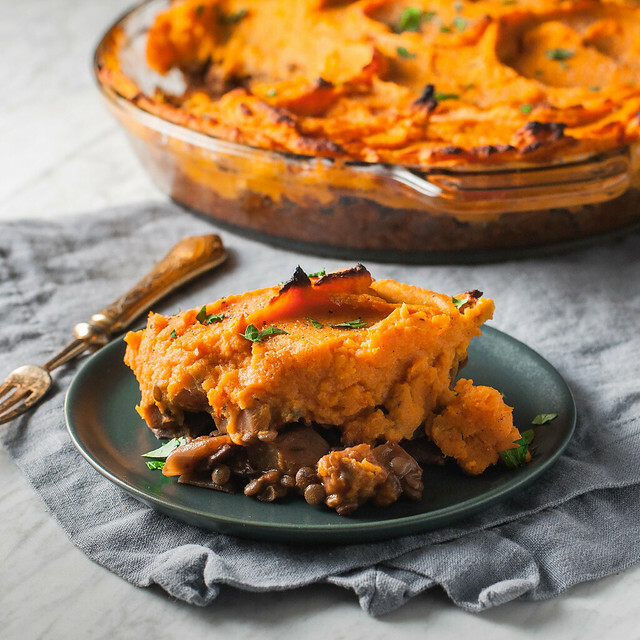 But, in a moment of clarity at the dinner table over this shepherd’s pie last week, I noted to Steve what I have accomplished: I’ve worked my way through a solid portion of a list of recipe ideas that’s been untouched for months. I’ve published three posts every week in February. When you compare that to four blog posts in January, I’d say I’m making progress. Increased traffic and an eBook will come, but for now, I’m digging in and getting the work done, putting out my personal best loved, well tested recipes that make sense in your life, too. 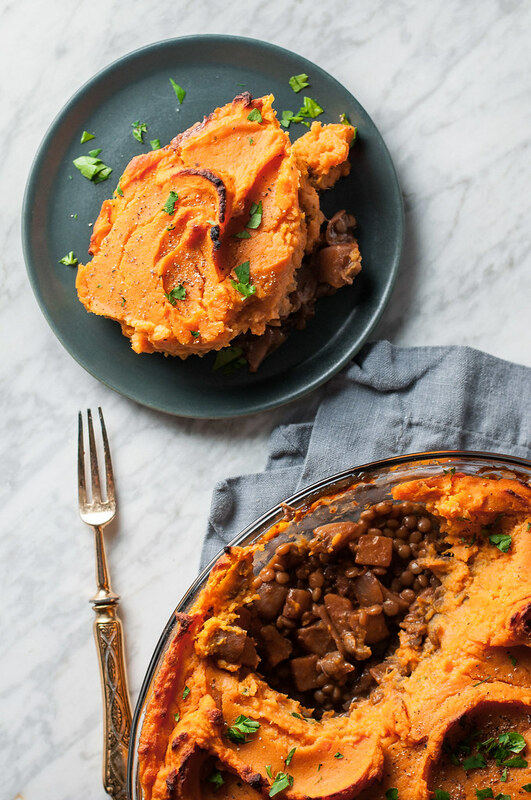 I hope sweet potato shepherd’s pie with red wine lentils does just that. It’s been so long since that day (sometime after Thanksgiving?) 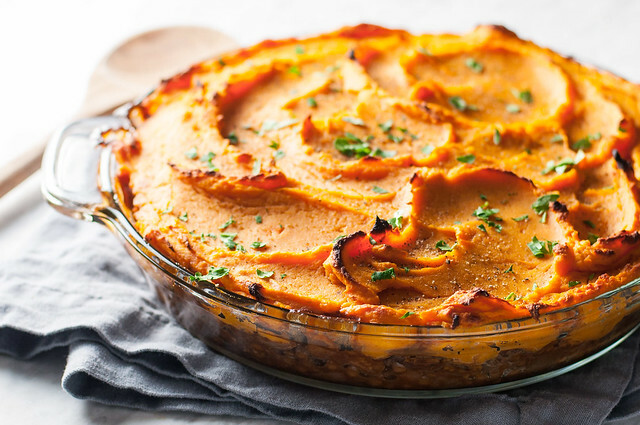 I was eating the best wine glazed lentils recipe, one I make often, which also happened to be my intro to The New Vegetarian Cooking for Everyone, and it just seemed like the right thing to do to bulk up the hearty vegetables, thicken the red wine sauce, and bake the whole thing in a pie topped with fluffy, browned-on-top mashed sweet potatoes. Then I let the idea sit sadly on a list in the depths of Dropbox, until the new year and its goals arrived. No more excuses. My best recipes come in pie format. They’re hardly quick and easy, but y’all overwhelmingly visit and make those recipes more than any others on the site. Hopefully this is one to continue my strong savory pie streak. Then, this weekend, we’ll change it up and make probably the easiest, best chocolate pie. No small statement, coming from a French silk loyalist. 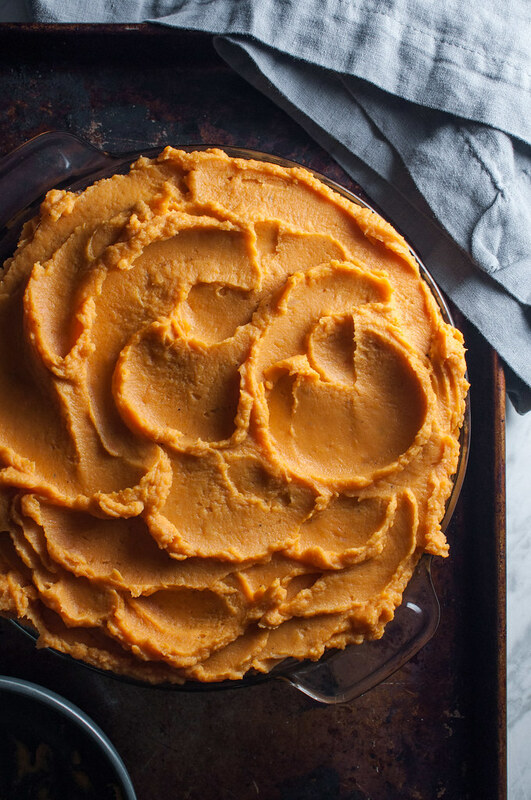 Get your pie pans ready! With many more to come soon. Vegetarian/easily gluten free. One of those hearty, comforting one-dish meals that's worth every minute of prep time. If preparing in advance (which works great), store filling and potato topping separately, assembling the pie just prior to baking. The red wine lentil mixture will even freeze well. 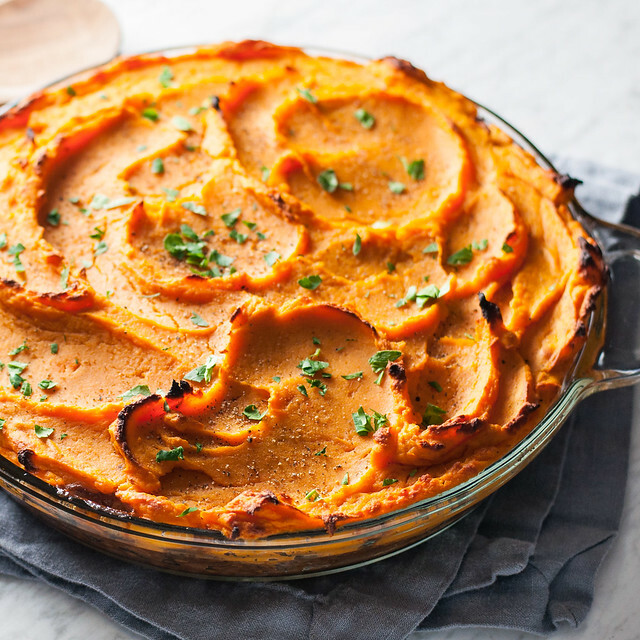 If storing the whipped sweet potatoes for more than a day, don't add the egg until you're ready to assemble the pie. Combine ingredients in medium saucepan and bring to a boil. Reduce heat to a simmer and cook uncovered until just tender, 20 to 25 minutes. Set aside but do not drain. Place potatoes and shallot in cold water to cover by a couple inches, in a saucepan, with two teaspoons salt. Bring to boil and cook until very tender, about 8 to 10 minutes. Drain and return to pan. Use an immersion blender to puree potatoes, then stir in butter, a teaspoon of salt, and a generous pinch of black pepper. Once the potato mixture has cooled at least 10 minutes, stir in egg. Heat oil in a large skillet (with a lid) just hotter than medium heat. Add onion, mushrooms, parsnip, squash/turnip and cook until well browned, about 8 minutes. Add tomato paste and garlic and cook another couple minutes. Lots of brown bits will be sticking to the bottom of the pan, which is fine. Add flour and stir until you no longer see white powder. Add wine and thyme, then scrape the bottom of the pan to release the brown bits. Raise heat to bring to a boil, then reduce heat to medium low, cover, and simmer about 10 minutes, stirring often. Add mustard, lentils, and remaining liquid and simmer uncovered until only a little liquid remains, a minute or two. Remove garlic cloves and stir in butter until melted, then season to taste. Place filling in a lightly oiled 9 to 9½" pie plate. 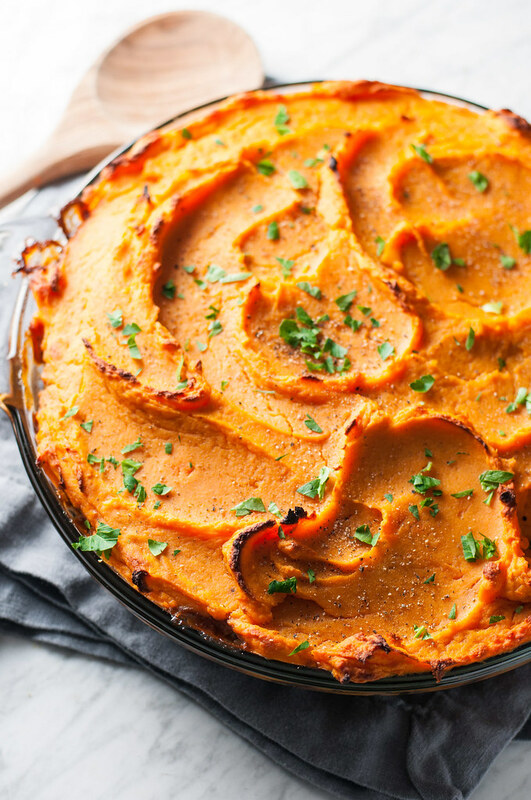 Spoon sweet potato mixture over the top (there will be a lot), spread evenly to the edges, and use the tines of a fork (or back of a spoon) to make ridges or swirls that will brown nicely when baking. Bake about 45 minutes just above middle rack position, until top is darkened in places. Let cool a couple minutes before serving, then garnish with chopped parsley, black pepper, and sea salt. If you can't find parsnips, feel free to substitute carrots. 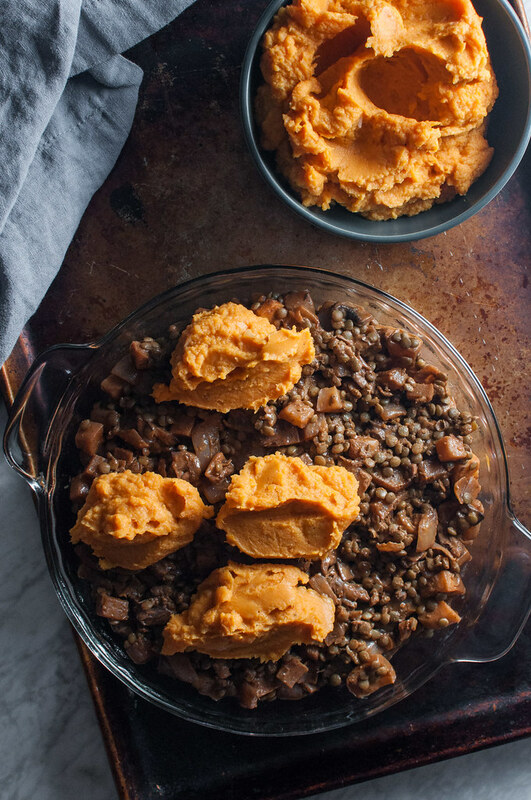 Prep time assumes that lentils and sweet potatoes cook at the same time. You can save some time, effort, and dishes by using store-bought, pre-cooked lentils, without much detriment to flavor. To make the dish gluten free, omit the flour from the lentil filling and reduce wine quantity to ⅔ cup. It will come out just as good, without the gravy-like thickness associated with traditional shepherd's pie.